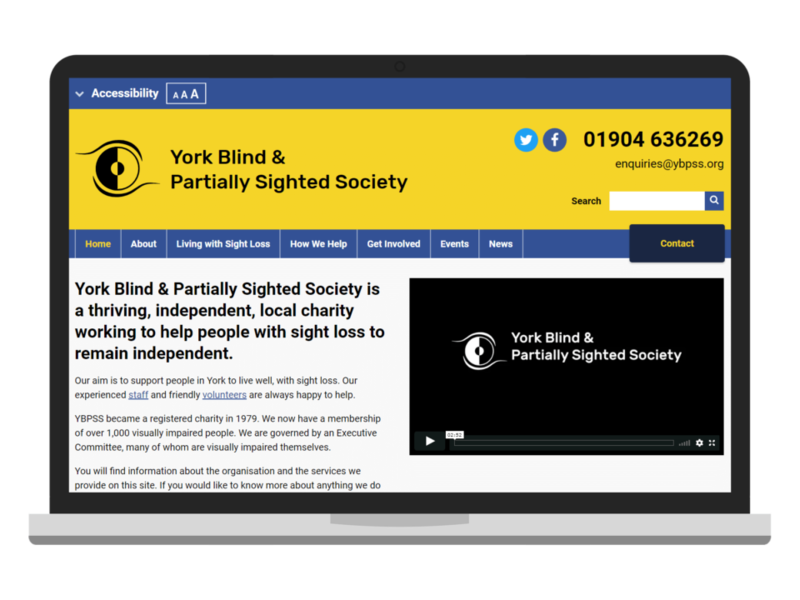 York Blind and Partially Sighted Society provides support and advice to a membership of 1,100 visually impaired people living in the York area. It is a long-established and widely respected member-led charity providing person-centred services from when sight loss is first diagnosed. Its complementary services are available without a referral from any other organisation: their mission is to help anyone live well with sight loss. When we started work, their existing basic website had been in place for well over ten years. It wasn’t mobile friendly at all, which was presenting a significant problem as increasing numbers of visually impaired web users adopt touchscreen technologies. The iPad in particular has high levels of usage due to its well regarded and sophisticated “VoiceOver” facility, which functions as both audio screenreader and gesture control. The site had to be clear and devoid of any visual clutter: no unnecessary background images or fiddly, detailed icons. We used Google’s open source Roboto font, which had been designed for high readability and to function well at small sizes on mobile devices. We pride ourselves on coding standards-compliant sites to give users with accessibility aids or highly customised setups the best possible chance at navigating the site, but this site had to go further. The site has to function as a potential starting point for visually impaired users without experience of web navigation, but who want to access YBPSS services. To that end YBPSS wanted an accessibility bar straight off and up top, with a link to a page that provides a crash course in web navigation for the visually impaired. Alongside this are the familiar font size and colour theme switches. The site provides an events listing system alongside the standard page and news post content. We have avoided inline images, which appear to screenreaders as alt text interleaved within the flow of the page. Instead, gallery images linked within the page content trigger the gallery popup. The site was tested by users of YBPSS services before launch, and we hope that there will the opportunity to further improve its accessibility in future as more YBPSS service users visit the site.